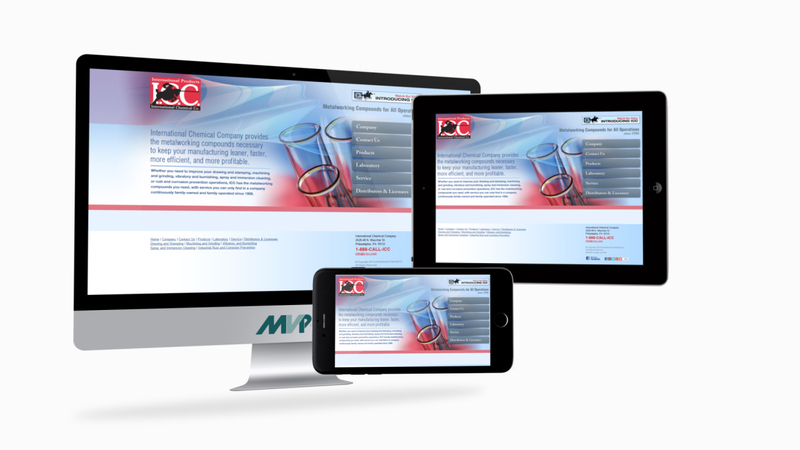 ICC takes a huge leap ahead in their online marketing efforts with a beautiful, newly redesigned website that features effortless navigation and intense pre- and post-launch search engine optimization. ICC came to DDA in early 2013 ready for a complete redesign and redevelopment of their website. Not only did they want a more contemporary look and feel, they also wanted it to be a robust search engine marketing platform with well-planned keyword-rich content to drive prospective customers to the site. Furthermore, they wanted to be sure to target tablet users particularly to ensure that they were reaching their target audience of industrial manufacturers. DDA determined through initial research that a large body of relevant search engine optimized content would need to be developed to allow the website to compete effectively for industry-relevant keywords. This content needed to be well organized so that users would only need to click down two levels from the home page to find any information that they wanted on the company. DDA would also establish a variety of forms to facilitate first contact with prospective new customers. Beginning with an initial outlining of the focus of search engine optimization efforts by the client, DDA created a content development plan which contained scores of keywords selected to direct traffic from the industrial manufacturers which make up ICC's client base. A wireframe was developed that helped map out how to best deploy keyword-rich content for maximum effect. The new website was designed with a more contemporary look and feel and highlighted images of glass decanters subtly refracting rainbows of light, helping to evoke a sense of ICC's quality products and chemical expertise. An innovative menu system was designed to bring maximum ease of use to tablet users, with large buttons for the menu and submenus aiding in fast, simple navigation to the topics of most interest. The introductory ICC video, which had proven to garner numerous compliments when distributed at trade shows, was just a click away, occupying space at the header of each page opposite to the ICC logo. Page and font colors and styles were precisely designed to complement the established branding established by DDA on previous projects. Contact and MSDS request forms were established to facilitate communications with new and existing clients. Additionally, six Product Selection Survey forms (one for each of their main product lines and one for their custom formulations) were established to help ICC receive all the details they would need in order to recommend a specific formulation to a client. An SEO menu of landing pages designed to further leverage DDA's initial keyword research helped to add even more strength to the website's performance in search engines, and a whole section was devoted to Case Studies describing ICC's many success stories about the real-world results customers obtained by switching to their manufacturing chemicals. Search engine optimization of the website would continue to improve as a result of ongoing efforts that come a part of DDA's proprietary SureThing™ search engine marketing program with free website hosting. ICC made the new website a main attraction at a November '13 trade show and received numerous compliments. As they had already established the website URL and generated some results due to previous SEO efforts, the new keyword-rich content quickly jumped them to the first page of Google for scores of important industry terms. ICC was quite impressed, telling DDA: "The user-friendliness on an iPad was spectacular, the pages loaded quickly and the sizing of all design elements, menus and fonts is perfect."